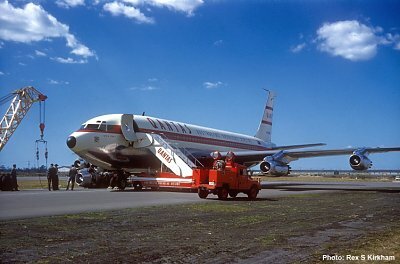 THE DAY THE QANTAS 707 FLEET DIVERTED TO BRISBANE. VH-EBC and VH-EBB together in Brisbane. VH-EBB undergoing an engine change in Brisbane. VH-EBB and DC-4 VH-EBM together in Brisbane. 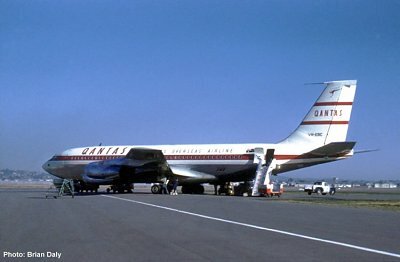 On Sunday 16 August 1959, Qantas Boeing 707 VH-EBC City of Canberra under the command of Captain Ian Ralfe and carrying 81 passengers and 13 crew was due to arrive in Sydney from San Francisco (via Honolulu and Nadi) at 1230 but strong crosswinds in Sydney forced it to divert to Brisbane where it arrived at 1324 landing on "Brisbane's newly completed jet strip". The Brisbane Courier-Mail also reported that "thousands of people flocked to the airport" to see the 707. It was reported that the aircraft was parked some distance from the terminal to avoid areas of freshly laid tarmac. Three buses ferried the passengers and crew to the terminal where they were cleared by three Customs officers who had been called in for the diversion. Rex Kirkham from the Qantas city sales office recalls that the passengers included Qantas General Manager C.O. Turner, a group of Boeing executives and a party of travel agents. Rex was tasked with showing the Boeing executives around Brisbane while they waited for a flight to Sydney. The Courier-Mail also reported that: "Qantas Queensland Manager (Mr. F. W. Angell) said all passengers were cleared from Brisbane Airport for Sydney by domestic airlines by 1930". (Although the crosswinds still prevailed in Sydney, conditions were not as limiting for prop-jet or piston domestic aircraft as they were for the 707). As the last of the passengers from VH-EBC was departing from Brisbane, another Qantas Boeing 707 VH-EBB City of Sydney flown by Captain Ron "Torchy" Uren and Captain Max Bamman was preparing to depart Sydney for San Francisco (via Nadi and Honolulu) on its first revenue service with 73 passengers and 15 crew. Although the strong crosswinds still prevailed, this did not prevent VH-EBB from departing at 1925. However, not long after departure, while 150 miles from Sydney, number three engine was shut down because of low oil pressure and VH-EBB turned back to Sydney at 1947. The aircraft circled overhead Sydney at 29,000 feet burning off fuel while the crew hoped that the crosswinds would abate. While orbiting Sydney, the passengers were served dinner. The aircraft had departed Sydney with fuel for 6 hours 33 minutes so there was no urgency to land. It was reported in the local press that the maximum crosswind for a 707 to land was 23 knots and the minimum runway length was 6,000 feet. This meant that only the east-west runway was long enough and it was all crosswind. Winds averaged 30 mph for hours and one gust at 60 mph was recorded at 2115. (The apparent inadequacies of Sydney Airport received much attention in the Sydney Morning Herald over ensuing days). At 2213 the aircraft diverted to Brisbane where it landed at 2325 to join VH-EBC which had diverted earlier that morning. Local press reported that the flight from Sydney to Brisbane had been in the record time of 49 minutes (a 707 had done the trip in 58 minutes on 16 July). For this to be a valid comparison it would suggest that the strong southerly tailwinds had more than offset the loss of an engine! The Courier-Mail reported that "the passengers and crew were taken by bus to Lennons Broadbeach and the Chevron Hotel, Surfers Paradise, to spend the night. A Qantas spokesman said that it had been impossible to arrange accommodation for them in Brisbane because of the Exhibition bookings. He said the passengers would leave from Brisbane in another Qantas Boeing 707 jet at 2.30 p.m." (on Monday 17 August). (August was then and is still to this day one of the worst times to be accommodating disrupted passengers in Brisbane because of the annual Exhibition, a state fair which draws visitors from all over Queensland). The press also reported a second flocking of spectators to the airport but this time it involved "more than 100 people in pyjamas"! Brisbane resident and aviation enthusiast, Brian Daly, heard of the diversions on the ABC radio news on Monday morning so he dashed out to the airport where he found that possession of a camera allowed him to mingle with a group of press photographers who were being ushered across the tarmac to photograph the aircraft. 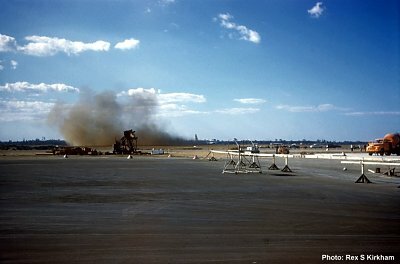 Brian's historic colour photograph of both 707s together on the Brisbane tarmac was later to become the catalyst for this story. Although a departure time is not recorded, VH-EBC evidently departed Brisbane early on the Monday morning for Sydney where it was required to take up the scheduled service to San Francisco. Although it is not stated in the Qantas Maintenance Log, it is clear that VH-EBC must have operated via Brisbane to pick up the passengers from the previous day's diverted service. The Courier-Mail reported that the City of Canberra (confirming VH-EBC) departed Brisbane at 1445 on Monday 17 August for Nadi, Fiji "trailing four clouds of sooty black smoke" witnessed by an estimated two thousand spectators. Earlier on Monday 17 August, the Qantas DC-4 VH-EBM Philippine Trader had departed Sydney at 0545 with a replacement engine for VH-EBB. The DC-4 arrived back in Sydney with the unserviceable engine at 2015. The Courier-Mail reported that VH-EBB was expected to depart for Sydney at 0700 on Tuesday after the engine change had been completed. As VH-EBB was due to begin several days of training at Avalon from Tuesday 18 August, it is likely that the aircraft positioned directly to Avalon from Brisbane. 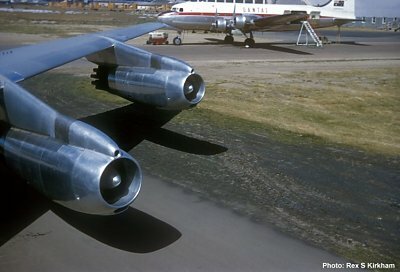 Although the Qantas Boeing 707-138 was certified to carry a spare engine in a fifth pod, this was not an option on the day in question. VH-EBA had been retained by Boeing for certification of the fifth pod and although VH-EBA was in Australia during the events in question it is not known if the fifth pod had been approved for airline use. In any case, it will be seen that fifth pod was not an option because of aircraft availability. At this time, only four 707s had been delivered to Australia. Of these, only two were available for service and both of these had diverted to Brisbane! VH-EBB was delivered to Sydney on 2 July 1959. VH-EBC was delivered to Sydney on 9 July 1959. VH-EBA was delivered to Sydney on 20 July 1959 but it was undergoing a check in Sydney on 16 August and did not return to service until 19 August. VH-EBD was delivered to Sydney on 12 August 1959 but did not enter service until 14 October having been used for crew training at Avalon in the interim. VH-EBE the next 707 to be delivered, did not arrive in Sydney until 17 September 1959. 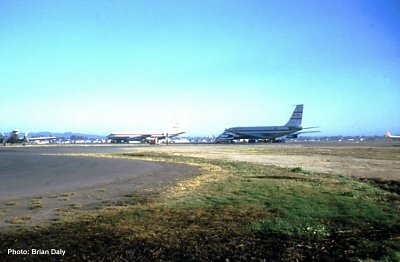 VH-EBC was sold in March 1967 and was later leased to Canadian Pacific Airlines in whose service the aircraft crashed at Vancouver in February 1968. VH-EBB was sold in April 1967 and went on to serve several airlines. Ultimately, like many of the Qantas 707-138Bs, it was converted to a VIP aircraft. It served in this role until August 1998 when it was damaged beyond repair in an arson attack at Port Harcourt, Nigeria. The DC-4 VH-EBM was sold in October 1959, just two months after the events in discussion. While serving as a freighter with Trans Mediterranean Airlines of Lebanon, the DC-4 crashed into the sea on take-off from Brindisi in July 1962.